My name is Robert Goltz. I live in Las Vegas, NV. Wednesday, September 28, 2011 was a beautiful day in town, blue skies, a little warm to my tastes but full of promise. 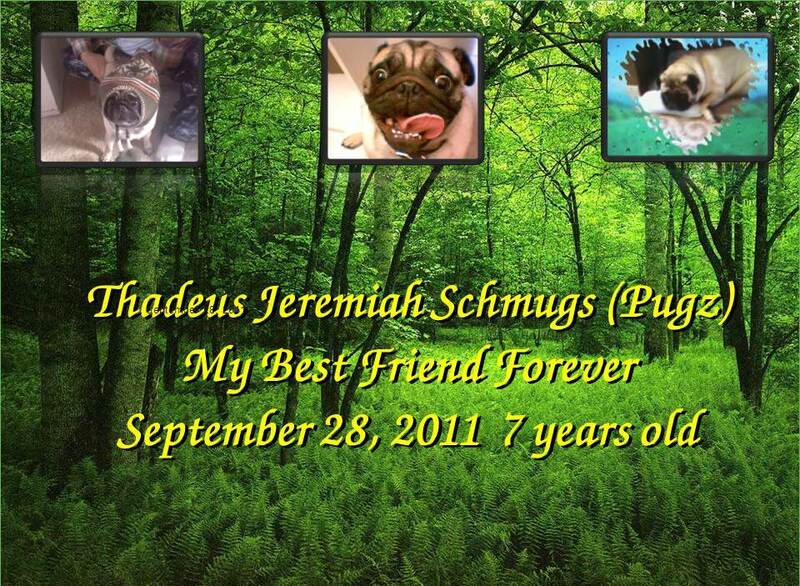 I was hurting, my best friend, Thadeus Jeremiah Schmugs (Pugz) a seven year old Pug, had come down with a horrible, death dealing, in-explicable case of Auto-Immune Hemolytic Anemia. Completely idiopathic, and killing him. It started the Thursday prior. He was suddenly slow, unable to stand and his tongue and gums white. We (Sally and I, a.k.a. Mom & Dad) took him, his brother and sister to the vet for their shots and to have Pugz checked. She immediately recognized his anemia and after a quick blood test, rushed us off to a Veterinary Emergency and Critical Care hospital in town. He required immediate transfusions, oxygen, drugs, and ICU, 24/7 care. We visited every day, his red blood cell count bouncing around from an 11 to a 28 over the course of 24 hours for days. Ideally a dog should have a number by volume of between 30 and 50. We finally had to make the painful decision to stop treatment and let him go on that horrible Wednesday. He was not responding, gasping for air and too weak to enjoy life. We said our goodbyes, pet and loved him for 45 minutes before the doctor gave him the injections needed to take his life. We stayed with him for another 30 minutes till his body began to get cold, leaving that hospital knowing he would never again brighten my day with his funny face, distinct snorking, and loving attitude, especially to me. We shared a special bond. He saved my life, literally, after my heart attack and depression in 2006. Hi love was boundless and he took to my side, never leaving my feet for weeks.